If you’re in business and you’re not harnessing the power of social media you need to jump on that bandwagon now. If you are using social media marketing as a channel to grow your business, awesome! But do you know how it’s working for your business? You might be posting a video here or there to YouTube or some photos to Instagram. And you could be regularly posting to Facebook and Twitter, but if you’re not measuring how those social networks are working for you, and you’re not testing different approaches to maximize your results, you could be wasting valuable time. But where do you start? There are so many metrics you could be measuring on social media, so let’s cull down the list and make sure that the most important ones are at least being eyeballed. Reach is defined as the number of people who could have seen your post. If you post a Tweet to Twitter and someone RTs your Tweet, your Tweet has the potential to be viewed not only by your followers but by their followers as well. So it’s important for you to get as much engagement on your posts as possible to spread the word. Reach is used as the denominator for the engagement rate metric (see below). It’s important to have a large number of fans but avoid the scams of “buying a million followers for $25”. Those are typically fake accounts, and fake fans don’t interact with your content, it doesn’t matter how many you have. If your reach increased in a day or two, dig into what type of content you may have posted to get that spike and create and post more of that content. Speaking of engagement, it’s our next metric! Engagement is defined differently across the various social networks but in general it’s the total number of interactions with your posts. Consider Comments, Likes, RTs, Mentions, Favorites, Clicks, Views and any other action someone can take on a post to be engagement. See a spike in “Mentions?” Dig in and find out what type of content people are engaging with, if it’s beneficial for you engage back and post similar content! Engagement happens when you post something interesting to your followers. Interesting things that tend to get more engagement are photos (ask for captions! ), short videos (Vine), posing questions, memes, topical content (stay away from polarizing content) and timing (know when posts work) to name a few. For instance, try using images when you post to Twitter for an increase in engagement. And your Instagram posts should be a fun representation of who you are to get more likes, follows and comments. At Dasheroo our sticker makes its way around the world and posts awesome and fun content. Also consider the following: the best time to post on Facebook is not the same as Twitter. Facebook posts perform best on Thursday and Friday, while Twitter updates are better received Monday through Friday. It might vary by industry and business. Frequency of posts also lead to better engagement, but it depends on the social network. Since the life of a Tweet is so short you need to post multiple times a day, sometimes over 8! 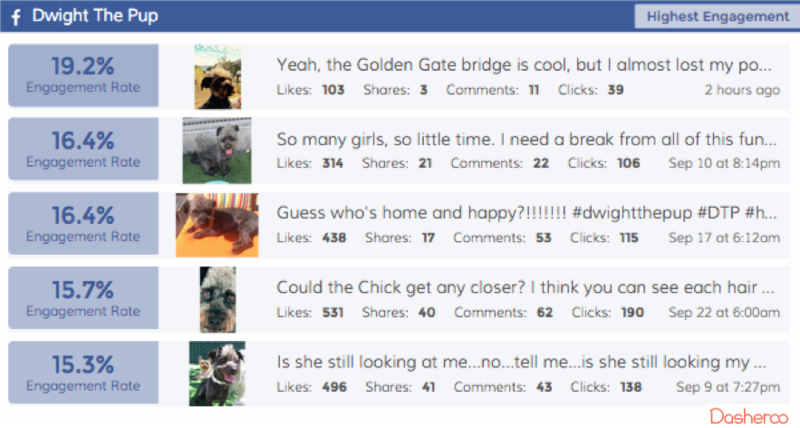 On Facebook, results have shown that posting more than 2x a day doesn’t increase engagement at all. So track engagement for this as well. If you are posting for a week to multiple social networks, at the end of that week look across all of your engagement metrics. Look to see if one type of post (images vs. text vs. video) did better than others. Look for commonalities and gear your next week toward that type of content. 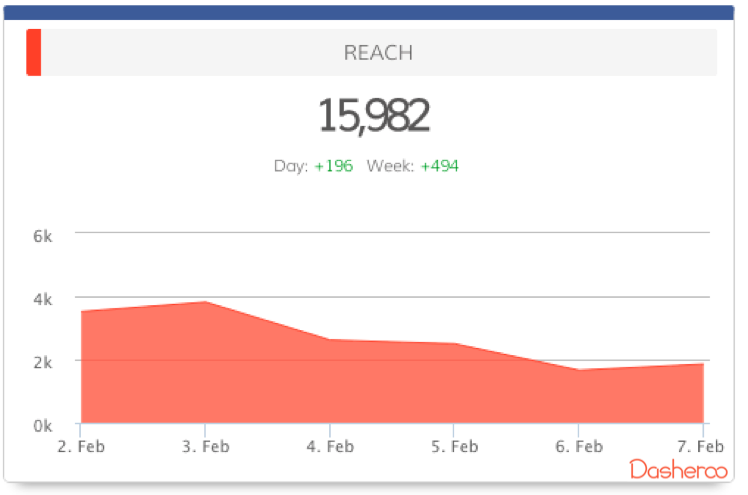 Now you can compare engagement rates across all of your social media marketing channels. You’ll of course want to track how many people are coming to your site from social networks if that’s where you’re sending folks! 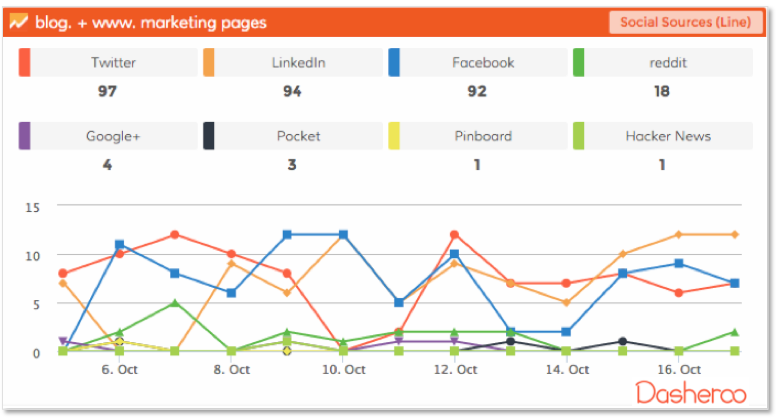 Using Google Analytics you can easily track which social networks are performing best. This company saw a surge in LinkedIn traffic to the site, time to dig in. And if you’ve got Goals set up in Google Analytics you can even track it all the way to a sale or whatever your call-to-action is. This company tracked traffic from social network all the way to a sign-up on a form using Goals in Google Analytics! Important to note: Google Analytics gives you visitors (Sessions) broken out by channel. One of the default channels is “Social” which is anyone who comes to your site from a social channel. But there is also a default channel labeled “Direct”. Keep an eye on this channel for those that don’t directly click a social link but remember your name and type it directly into the browser. If you’ve got a surge in social you might have the “hangover” effect and have a surge in your Direct channel as well. So make sure you’re keeping an eye on one of the most important metrics you can track and close the loop on your sale! It’s easy to be confused by what to track, especially at the beginning of your efforts! But if you start with these and keep your eye on them, test content and test different social networks you’ll be sure to get new business from social media! 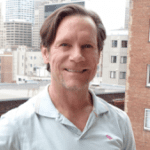 John Hingley brings 20+ years of sales & online marketing expertise with analytics-driven decision making & business savvy to help dozens of companies like Softkey, The Learning Company, Mattel, Wine.com, Chandon & VerticalResponse gain market share. He founded social media analytics company Andiamo Systems, acquired by Techrigy, Alterian and later HP. 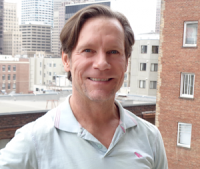 Currently John is a co-founder and CEO of Dasheroo, business dashboards done right. Now you can track all of your important business metrics from social networks, email marketing, web analytics and ecommerce in one place, free, see for yourself.